On the ground floor is the spacious living room with access to the veranda, overlooking the beautiful garden, as well as access to a bedroom with ensuite bathroom. Through the country kitchen, equipped with all comforts, one arrives at a cozy patio. The dining room with an atmosphere which reflects a bodega, gives access to two bedrooms with private bathrooms. One bedroom has a separate entrance from the garden. On the first floor are two bedrooms with ensuite bathrooms, one of which is the master bedroom with terrace. There is a large covered terrace, overlooking the beautifully landscaped garden with various species of trees, the pool and the imposing mountains. It is a fantastic property to live in or to be operated as a boutique hotel or B & B. 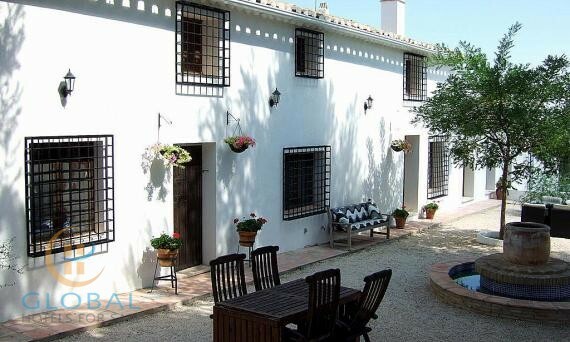 This wonderful luxury finca is surrounded by nature with spectacular mountain views. The finca was renovated into a tasteful luxury residence whose traditional architecture has been carefully preserved and was stylishly decorated with sophistication and comfort. Only the best materials were used.